I want to add/modify a filter criteria programmatically. For example, for a view, I added an "Email Address" filter whose value is needed to change dynamically, it is needed to set to the current logged in user's email id. How to achieve that? Please see attached image for more details. Please help. Use the Devel module and dpm($view) and dpm($query) after you put like "test@email.com" into the "value" field found in your pic. See the object/array structure of the view and query from the devel output. Then use the function hook_views_query_alter(&$view, &$query) in your module to target the WHERE condition filter condition and set it to the value you want. // php that customizes a view. // The index 2 below is the index of the condition for the email filter. // Your $query structure may be different in your dpm() of the View $query. I know you should probably set this using some esoteric, convoluted method, but if you just want quick and dirty access without messing around this will get you there. It would be preferable to alter these in hooks rather than at render time so that you are not undermining site performance and caching. Took me age to figure out that hook_views_pre_build() fires too late, you need hook_views_pre_view(). Edit note: This comment on d.o group helped me figure out how to get the views filters using $view->display_handler->get_option('filters') and to then override them using $view->display_handler->override_option('filters', $filters);. I have added contextual filters to the view itself (from the advance view settings fieldset). The first one is a "content: has taxonomy term ID". The 2nd one is "content: nid" with "allow multiple" checked and "exclude" checkbox checked (from the 'more' fieldset in the contextual filter pop-up). 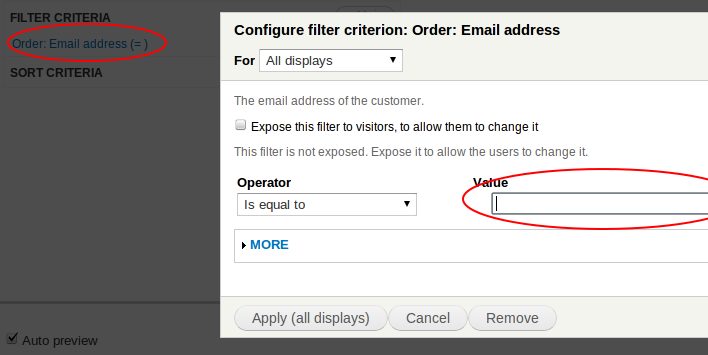 In Drupal 8 you can use ViewExecutable::setHandler($display_id, $type, $id, $item) to set a filter programmatically. The above query will add a criteria that filters nodes where the field_custom_criteria field equals the currently selected language. // Get referenced service - example for entity reference. // Add service id as a filter to view. // Only display operations nodes that reference the same service. // Don't include current operation in list of related operations. Comparing current user email with a field in a content view: is it possible?